James “Jay” Larman was a true Southern gentleman who lived his life with great passion. His strong faith was woven into every aspect of his life. He was a church elder, prayer warrior, taught Sunday school and led Bible studies. He gave generously of both his time and resources over the years. Mentoring many people throughout his lifetime, Jay encouraged them to follow Jesus and trust in His ways. He leaves behind a rich legacy of being a man of integrity. There is no doubt that he will be greatly missed and lovingly remembered by his many loved ones, special friends, and the countless lives he touched over the years. 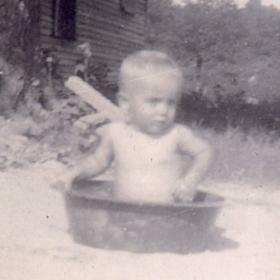 With banks still closing as a result of the Great Depression, the promise of a new election year waiting, and during the midst of one of the greatest droughts in American history, James Isaac and Josephine (Birdsong) Larman welcomed home their newborn son, James William on February 17, 1932, in Judsonia, Arkansas. Born the youngest of nine children, his birth brought light into an era of hard times. Growing up in a large family there was never a dull moment in the Larman household. Jay was well cared for by his older siblings and was downright spoiled, to be honest. Born with a natural ability for sports, Jay excelled at baseball and tennis in high school. Jay fell for Eva Lou Rubottom a neighbor who lived down the road and who was also exceptional on the basketball court. Two years older, she was equally taken with Jay’s natural charm and the two began dating. Graduating with the Class of 1950 from Kensett High School, he traveled to Michigan to live with his sisters. 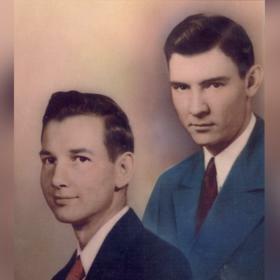 Missing his sweetheart he returned home and he and Eva Lou married in their preacher’s dining room in Kensett, Arkansas on December 27, 1950. The happy couple honeymooned along Lake Michigan’s beautiful shoreline in Muskegon, Michigan which immediately became their home together. Jay was working at Standard Automotive and after several years he accepted a position with Clarke Floor Machines working his way up from the floor to supervisor. He remained there for many years before retiring at the age of 62. Although work was a significant part of Jay's life, it was not to be overshadowed by his greater accomplishment of raising four wonderful children along with Eva. There simply wasn’t anything he wouldn’t do for his family including picking up additional jobs to meet their growing needs. Jay was a hard worker and spent many years cleaning carpets for extra money. He often recruited one of his sons or his daughters’ boyfriends to come along on many residential and commercial jobs. When he wasn’t busy working, he spent much of his time with his family and his lovely companion, Eva Lou. The two of them were blessed abundantly with many of life’s richest blessings. 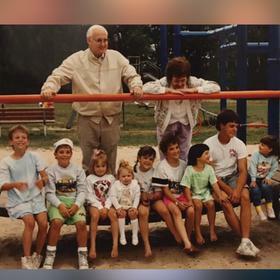 As a father and supportive husband, he modeled his love of God’s word and shared it at Gospel Halls on Sunday evenings, or would take his kids along with him to visit local retirement homes teaching them a lifetime of serving others. Each and every summer they carved out time as a family to vacation to Arkansas to visit relatives. Many of their favorite memories were from the years they spent traveling together. Retirement afforded Jay and Eva Lou time to explore many beautiful places as well as enjoy their grandchildren. They favored Florida and eventually moved there. When they became homesick for their family back in Michigan, they returned and Jay began work at PB Gast in Grand Rapids, MI. They soon returned to Muskegon, and since Jay was never one to remain idle for long, he found part-time work at Senior Resources in the Tanglewood complex as the Loan Closet Manager, where he brought his positive and warm-spirited personality to his co-workers and clients. He had a real gift for making people feel at ease as well as a genuine love of all people. In addition to his work at Senior Resources he was still picking up carpet work and painting jobs well into his eighties! Outworking those even half his age, Jay was remarkable in his attention to detail and his high level of aesthetics when it came to getting any job completed. Above all else, Jay leaned on his faith to lead him through life’s peaks and valleys. 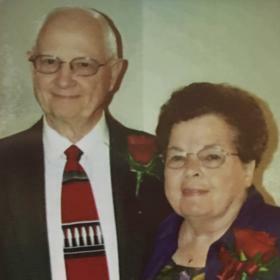 He was an active member of the Muskegon Gospel Chapel for many years and for the past twenty years made Olivet Evangelical Free Church his church home. Jay also spent his time with his grandchildren and loved to send them special notes and gifts along with words of encouragement. Nothing brought him greater joy than to share in their successes! Sadly in 2006, his beloved wife, Eva Lou died after a long battle with Parkinson's and Alzheimer's. No greater testimony of his love for her was the time he spent tenderly caring for her at home. He cared for her right up until the end when he eventually allowed hospital staff to support him on her end of life journey. Her passing was difficult on him and Jay leaned on the support of his family as well as his faith to see him through the challenging years without her. When he finally chose to officially retire from his active lifestyle of supporting others in 2018, his body was not accustomed to rest and didn’t respond well. Rest Haven Homes in Grand Rapids was the perfect setting for him to receive the additional daily care he needed. It was no surprise that the staff and other residents were easily drawn to him. Jay had such a deep connection with his family that he really struggled with taking his final steps to meet his Lord and Savior. However, he trusted in God’s plan and gracefully accepted his final days. Described as deeply caring, accepting, as well as loving, Jay’s physical presence will be greatly missed. May all those who were blessed to know him be comforted by his many special memories and the unconditional love he held for each of them. 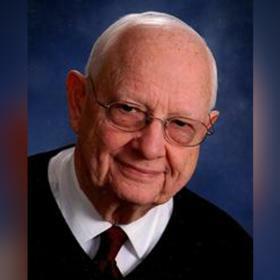 James “Jay” William Larman, age 87 of Muskegon, passed from death to eternal life on March 26, 2019 in Grand Rapids, MI. Jay was born February 17, 1932 in Judsonia, AR to the late James Isaac & Josephine (Birdsong) Larman. He graduated from Kensett High School. On December 27, 1950 he married the former Eva Lou Rubottom, soon moving to Muskegon, MI. He was preceded in death by his beloved wife, Eva Lou; and by his brother and five sisters, and Dale Carmean (son-in-law). Jay is survived by his children Teresa & Tom Kleyn, Rick & Cheryl Larman, Joyce & Brian McLellan, Bill & Christy Larman; 11 grandchildren, Patrick & Victoria Kleyn, Elisabeth Kleyn, Jason & Sarah Larman, Rachael & Caleb Bradford, Tiffany & Nathan Hamilton, Angela & Stephen Koster, James & Valerie Carmean, Stacy & Corey Johnson, Kristen & Tim Broilo, Bridgette Carmean, Kylee & Chad Stevenson; 16 great-grandchildren and 2 great, great-grandchildren; as well as many nieces and nephews and his friend, Brian Bailey. The service to remember and celebrate Jay’s life will be held on Sunday, April 28 at 3 PM at Olivet Evangelical Free Church, 6790 Harvey Rd, Spring Lake, MI 49456, with Pastor Craig Cramblet officiating. Friends may visit with his family beginning at 2 PM and after the service. A special thank you to Rest Haven Homes and Faith Hospice for the warm and loving care you provided. In lieu of flowers, Jay’s family requests that you consider a donation to either Rest Haven Homes or Safe Harbor Christian Communities. To read more about Jay’s life, to share a memory or photo, or to sign his guest book please visit www.lifestorynet.com.